Fathers Day (Sunday 19th June) is fast approaching so we have selected some of our most popular treatments that are already favorites amongst our male clients. Your eyebrows are one of your most important features of your face. Our therapists will tidy and shape your eyebrows for a natural look that will enhance your face. Get skin fit with a deep cleaning skin treatment for the face or body. 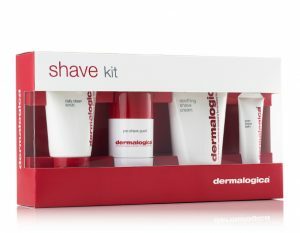 Rejuvenate your skin, remove blocked pores and reduce the signs of skins of ageing and skin pigmentation. Give your nails on both your hand and feet an overhaul…. Keeping your nails in good condition will make them stronger and help reduce those annoying little bits of skin that lift off around your nails. Spray tans are not just for girls! Male Spray tanning is growing in popularity… Footballers and actors are now often seen on TV sporting there natural looking healthy (spray) tan. The Mail on Sunday has recently published an article claiming that spray tanning can help define muscles! So looks like the secret we have been keeping for years is now out. Swedish, Aromatherapy, Deep Tissue or Hot Stone. Yes we are talking all things massage… Massage is our most popular treatment currently chosen by our male clients with deep tissue being top of the list! Traditional Swedish massage has a number of health benefits. In addition to providing a general sense of relaxation, a Swedish massage can help promote healing and reduce pain. Our Aromatherapy treatments stimulate the nervous system to release congestion and re-balance areas of the body affected by physical or mental stress. 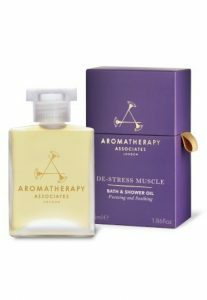 At the same time, the essential oils are absorbed into the bloodstream enhancing cell renewal, circulation and detoxification, while their aromas act on the deepest parts of the brain to enhance our mood and emotions. Relieves tired stiff joints, gently slows down heart rate and inner organs, boosts the immune system, promotes relaxation, encourages sleep, gives a sense of well-being, lowers blood pressure and gives more flexibility to joints. Deep tissue massage works deep into stiff, tight, aching muscles, to instantly release pain and tension. 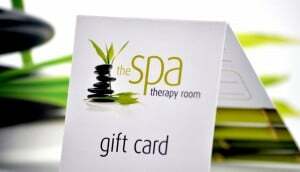 The Spa Therapy Room gift card is ideal if your still not sure which gift to buy. You choose the amount you want and fill in your details and we will send the Gift Card to you or recipient. 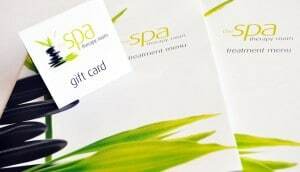 Gift cards are presented with treatment menu and envelope.